Taking Your Hi Fi on the Highway. Yup! 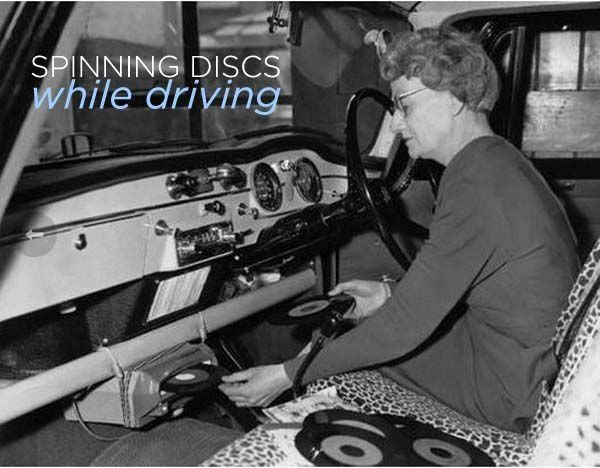 A little record player for your car, ready to spin your favorite 45s. I love the old ads for it. And look at this fellow on the directions. Clearly driving someplace woodsy with all that plaid flannel! And clearly they were popular with celebs too! Fancy! We’d love to get one for our car, but they seem to cost upwards of $700 on Ebay nowadays, but we’ll think good thoughts and wish we had one of these beauties! Hee hee! Any road trips plan this month, friends? Oh Wow!!! Love the photos. Dottie, go find the book “The Watsons Go To Burmingham – 1963” (if you don’t already have a much loved and dog-eared copy). There are some great scenes when the family gets a record player for their car! ZOMG! I totally will! Thanks for hipping me to that jive, girl!